When you look back on 2015, what will you remember? A new baby in your family? The death of someone you loved? An exhausting move across the country or even the continent? You're not alone. Worldwide, there was a birth every 8 seconds in 2015, and a death every 11 seconds. And millions of people--many of whom may be a lot like you--left their homes in search of safer places to live, where they'd find fewer explosions and executions and other everyday horrors that accompany war. Twenty-fifteen has been busy, exciting, frustrating, heartbreaking, and inspiring in turns for those of us who work in global health and development. We've seen much needless death this year. But there have been instants of hard-won progress and hope, too. 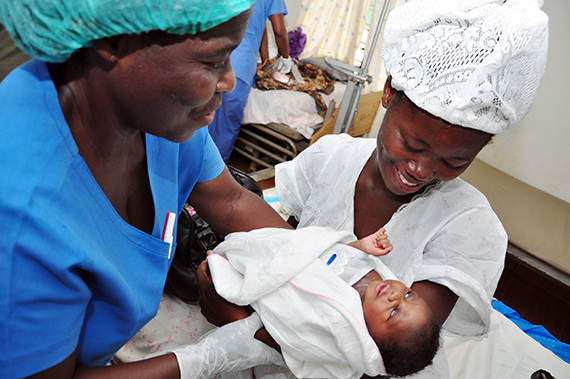 Maternal deaths fall 44% from 1990. The Millennium Development Goals deadline arrived this year, revealing (among many other results) that maternal deaths around the world have dropped from about 532,000 in 1990 to 303,000 in 2015. Not all countries made progress in ending preventable maternal and child deaths, and even in countries that met their targets, health and gender inequities still exist. But this is progress worth celebrating. Ebola recedes (then resurfaces, then recedes again). In Guinea, Liberia, and Sierra Leone, residents have rejoiced as Ebola infections slowly ebbed in 2015, though Liberia was experiencing new cases as recently as November 22. The World Health Organization estimates that Ebola has killed 11,300 people since March 2014, including over 500 health workers. Recovery efforts are focusing in part on rebuilding stronger, more resilient health systems in hopes of preventing future epidemics. MERS follows on Ebola's heels. Another dangerous outbreak--this time MERS in South Korea--infected hundreds of people, shut down hospitals and schools, and upped the wattage of the spotlight already shining (thanks to Ebola) on the global risks of fragile health systems. The WHO held an emergency meeting to address the outbreak. And through the new Global Health Security Agenda, the US is working with partners around the world to prevent future epidemics, detect biological threats early, and rapidly respond to disease outbreaks. Pope Francis inches forward the conversation on family planning. While he certainly doesn't condone contraception, his comments and actions--promoting responsible parenthood and empowering priests to absolve the sin of abortion--have made headlines this year. As the global health community prepares for the biggest-ever International Conference on Family Planning in 2016, these topics are on a lot of our minds. US announces Africa needs additional one million health workers to address HIV. Global AIDS Ambassador Dr. Deborah Birx made the announcement at a Capitol Hill briefing in March organized by the Frontline Health Workers Coalition, IntraHealth International, and the Elizabeth Glaser Pediatric AIDS Foundation. No disease requires more health workers than HIV, the briefing revealed. And it's a good investment--training health workers in HIV care, Birx said, prepares them to manage many other diseases as well. Gun violence in the US escalates to an average of more than one mass shooting per day. And that statistic only accounts for shootings where four or more people are wounded. There are 3.5 firearm homicides per 100,000 people in the US, according to the US Centers for Disease Control and Prevention. But this isn't the only country where gun violence is a public health emergency: El Salvador, Venezuela, and Colombia have some of the highest rates of firearm homicides in the world. The global health community lost at least two invaluable members to gun violence in 2015: Anita Ashok Datar in Mali and Raluca Iosif in North Carolina. A million refugees come ashore in Europe. If you've turned on the news in the last six months, you've heard about the refugees fleeing war and ISIS at home and seeking refuge in Europe. You may not have heard, though, of those fleeing Libya, South Sudan, Central African Republic, or other countries in the midst of other wars. Or that millions are left without access to health care. In fact, many of those who are threatened by or fleeing violence are doctors and other health workers. And when they're forced to abandon their homes, it only further depletes the health systems in the countries they leave behind. UN International Labor Organization finds that over half of the world's rural population will go without health care in 2015. Even though the world's population is rapidly becoming more urban, nearly half of us still live in rural areas. An ILO report found that 56% of the world's rural population and 83% of Africa's rural population live without critical health care access. This amounts to a deficit of approximately 7 million health workers in rural areas. The Sustainable Development Goals begin. These 17 new global goals are the result of 193 countries standing together and making a plan for a healthier, more prosperous world. They cover health, education, the environment, economic growth, and more (though a few key elements are missing). These goals will define the next 15 years of human progress, and could even guide us to an AIDS-free generation. The Paris climate accord prompts landmark commitments from 195 countries. The historic agreement to ward off the most devastating effects of climate change comes as El Niño delays rains in Ethiopia, causing the country's worst drought in 30 years. The WHO has deployed emergency response teams to help Ethiopia's health sector respond not only to the urgent need for food, but to the inevitable malnutrition and disease that accompany famine. Of course, these are just a few moments among many. I work at a global health organization that focuses primarily on health workers and their role in health systems around the world, so I've viewed this year through its lens. But what else has shaped global health in 2015? And what could be in store during the year to come?